Home » Post tagged "Beginner Art"
These classes were specially created for adults with no painting experience. A friendly and fun teacher guides you through all the steps while you listen to music and sip lattes at Starry Night Cafe or sip local beer at Pateros Creek Brewery in Old Town. Fall is the perfect time to host a private painting party! Classes are great for Birthdays, Bridal Showers, or even Ladies Night. Details are on the Host a Party Page. or email us at Lauren@GadaboutArt.com. We also teach private classes for adults or kids. Thanks for checking out the January 2013 Guided Painting Class Schedule! 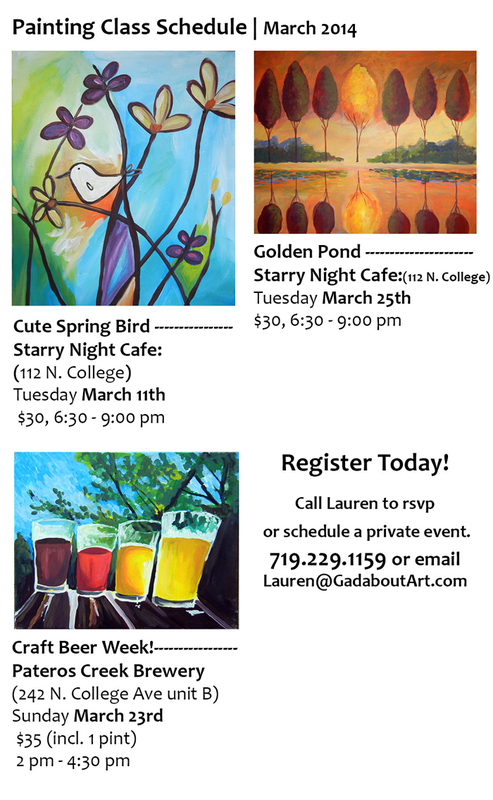 Gadabout Art classes are held at local restaurants, coffee shops and breweries. So far Cafe Vino, Tasty Harmony Restaurant and Starry Night Espresso Cafe and Pateros Creek are hosting in 2013. Classes can also be held at your home or office. Give Lauren a call to RSVP or schedule a private painting party! (719)229-1159 or email Lauren@GadaboutArt.com. Join us this month at the Bean Cycle, Cafe Vino, Starry Night Espresso Cafe, or Pateros Creek Brewery to learn how to paint in a casual atmosphere amongst friends! We are in search of a few new venues! Feel free to write with suggestions or book a private party.